Pain and tenderness in the big toenail is not an uncommon complaint but common or not, the discomfort can be so great it can stop you from doing the activities you normally do or wearing the shoes you want to wear. If your toenail is tender and sore it is most likely because the toenail is ingrown. 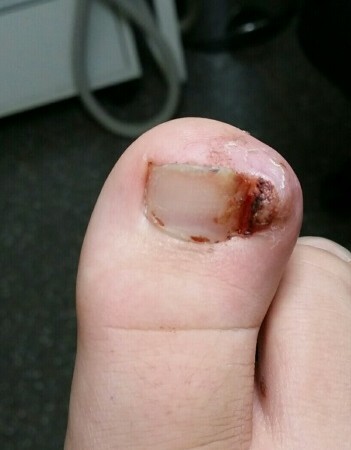 An ingrown toenail (or onychocryptosis) is a toenail that has grown into the skin or occurs when a fold of skin on the side of the toenail has grown over the nail. The condition commonly occurs in big toenails but any of the other toenails can also be affected. Left untreated it can become swollen and red and infected, causing a great deal of pain. A variety of factors and influences can result in ingrown toenails. Some types of physical activity may cause repeated pressure on your toes and this may also result in an ingrown toenail developing. Additionally an ingrown toenail can occur from a trauma to the toe, such as stubbing the toe or having the toe stepped on or dropping a heavy object on it. The other major cause of ingrown toenails is the consistent wearing of shoes that are too tight. It is pertinent that in populations that do not wear shoes, there are no reports of ingrown toenail cases, which makes us assume a link between footwear and ingrown toenails. It is important to make sure that the shoes you wear on a regular basis do not constrict your toes, especially shoes in which you do physical activity. That means the shoes you wear all day at work, particularly if you are walking to and from transport, as well as sports or performance shoes. And while we all need to regularly cut our toenails, we have to be careful to not cut our nails too short. Sometimes if you cut your toenails too short it can result in an ingrown toenail developing. Excessive trimming of your nails can encourage your nail to grow into the skin and a fold of skin to form over the nail bed. To reduce the risk of this occurring, you should regularly and properly trim your toenails. And, unfortunately, some people are always going to develop ingrown toenails because their genetics result in their toenails growing too large for their toes. Have your toenails regularly and correctly trimmed by a trained podiatrist. Wear properly assessed and fitted footwear, for your everyday as well as physical activities. Wearing shoes when doing jobs around the house, like gardening or moving furniture, will help protect your toenails should you fall or drop a heavy object on them. When kids are playing outside, riding bikes or skateboarding, for example, wearing proper shoes ensures their feet are adequately protected from childhood thumps and bumps. Ingrown toenails can be treated either with a simple procedure where the nail spike is removed from the affected toenail or, in more severe cases, surgery under local anaesthetic to remove part or all, of the nail. However, treat your feet with the care they deserve and you can help avoid ingrown toenails altogether.